The goalie gets physical with the Penguins' Patric Hornqvist, and both are penalized. PITTSBURGH – Robin Lehner has a message for any player who wants to get physical with him in the crease: It only makes the Islanders goalie better. 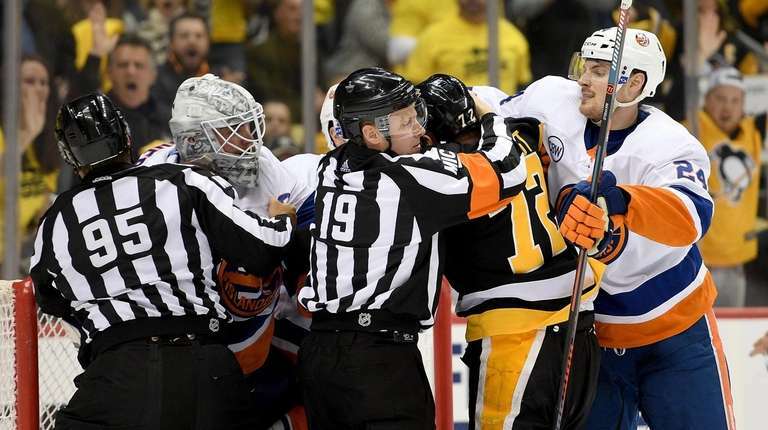 Lehner stopped the last 32 shots he faced as the Islanders swept their first-round series against the Penguins with a 3-1 win in Game 4 Tuesday night at PPG Paints Arena. The 6-4, 240-pound Lehner also had to be separated from fellow Swede Patric Hornqvist at 10:33 of the second period. Hornqvist was trying to establish position at the crease with Lehner trying to push him away, giving him some whacks on the leg with his goalie stick. The stick swings and shoving quickly escalated, with Lehner looking like he was ready to fight before linesman Jonny Murray separated him from the scrum. Lehner received a two-minute slashing penalty, but Hornqvist received a double-minor for roughing. They spoke genially during the postgame handshakes. Islanders coach Barry Trotz led the Capitals to that franchise’s first Stanley Cup last season. And when he was presented with his Cup ring before the Capitals’ 4-1 win at Barclays Center on Nov. 26, Trotz was allowed to address his former players in the visitors' dressing room. “You’ll have to go through the Island, but you guys can do it again,” Trotz told the Capitals that night. It very well may prove prescient as the Islanders await the winner of the Capitals-Hurricanes first-round series. “If it happens to be Washington, what I said will be played forever on every newscast,” Trotz said. Jordan Eberle left the ice for the Islanders’ dressing room late in the second period but the right wing said he had just broken his skate … Per Islanders team statistician Eric Hornick, the Islanders trailed the Penguins for only 4:51 in the four-game series … Left wing Matt Martin was credited with 11 hits …Defenseman Scott Mayfield logged 20:55 with two shots and two blocked shots after missing Monday’s practice for maintenance. The Penguins’ power play ranked fifth in the NHL in the regular season but converted just once in 11 attempts in the series … After trying Dominik Simon on the top line in Game 3, Mike Sullivan started Game 4 with Jared McCann on Sidney Crosby’s left wing, shifting Jake Guentzel to right wing. “I think we need to change something up and we did that,” said McCann, who had an assist on Guentzel’s goal … Defenseman Olli Maatta was a healthy scratch for the third straight game as Jack Johnson remained in the lineup.